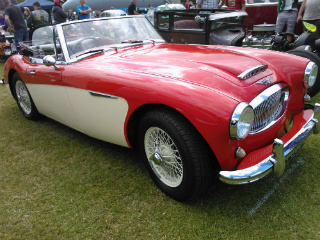 The Austin-Healey 3000 Mark 1 sports car received a number of improvements in 1959 over the previous 100/6 variant, such as front wheel Girling disc brakes, and the C-Series engine enlarged to 2912cc, which increased output by seven bhp to 124 bhp, and gave it a top speed of 114 mph. In March 1961, the 3000 Mark 1 was phased out after 13,650 units had been built. Its successor, the 3000 Mark 2 sports car, was introduced in May 1961, and was offered as either a two seater convertible, designated the BN7, or the occasional four seater 2+2, designated the BT7. 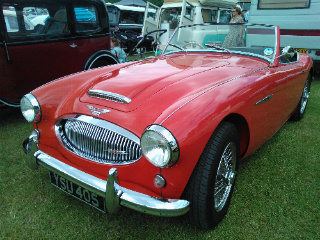 At that time, it was regarded as an alternative to the TR3A, and was less expensive than the E-Type. After 1961, servo assisted brakes were no longer offered as an optional extra. Following on from the Mark 1, both versions had flat front windscreens, and detachable Perspex sliding side screens. They were powered by the BMC C-Series, 2.9 litre, 6-cylinder engine which was now uprated by the use of modified valve springs, and a new camshaft. The Mark 2 received a new gearbox casing and linkage which incorporated a selector mechanism that had a more direct action. This resulted in the gear lever now being positioned in the centre of the transmission tunnel. An interesting feature was the fact that previous models had all utilised two SU carburettors. However, the Mark 2 now sported three, HS4 carburettors which, together with the other two modifications, increased output by a further eight bhp from 124 to 132 bhp. Road test showed that, although output increased to 132 bhp, there was no improvement in performance. Furthermore, it turned out that keeping the three carburettors in tune was not an easy task. Consequently, BMC decide, a year later, to revert back to the two HS6 carburettor configuration in which, following slight engine modifications, there was no loss of power. The rear panel of the BT7 was cut back to make room for the two occasional rear seats. However, this arrangement was not a desirable feature for racing and rallying, where the focus was more towards the BN7 variant. The Mark 2 used a separate ladder type frame supporting a steel body, and a four speed gearbox fitted with an overdrive unit. The BT7 was by far the more popular, with only 355 units of the BN7 being built in comparison with 5,096 units of the BT7. Optional extras included chromed wire wheels, servo assisted brakes, and a tonneau cover that could be opened so that, whilst driving, the passenger area was covered. In 1962, there were some significant changes which accompanied the introduction of the 3000 BJ7 Sports Convertible, otherwise known as the Mark 2a sports car. And, not before time, the replacement of the sliding side screens with wind up windows. Production of the Mark 2 BN7 ended in March 1962, and that of the BT7 three months later. The Mark 2a version continued in production until the launch of the Mark 3 in October 1963. This brought the 3000 more up-to-date, and enhanced its role as a touring car. However, somewhat surprisingly, and from its launch, a factory hard top was no longer available as an optional extra on the Mark 2a. A total of 11,564 units of the Mark 2 were built - 355 BN7, 5,096 BT7, and 6,113 BJ7. 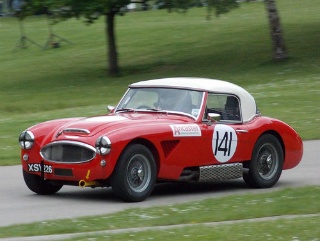 Donald Healey was instrumental in the special Austin-Healey factory BN7 race cars being fitted with three Webber twin choke carburettors. Being only a two seater and fitted with three carburettors, the Mark 2 BN7 offered the basic formula for what could be regarded as a true sports car. In fact, this model was regarded by many as the last of the two seater Big Healeys, and as such was a very collectible item. 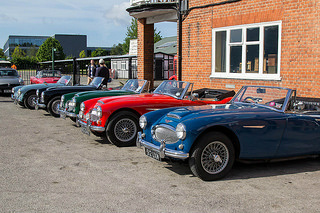 With the pedigree of the early Healey 100's combined with the power of the later versions, it could be regarded as the ultimate Healey. 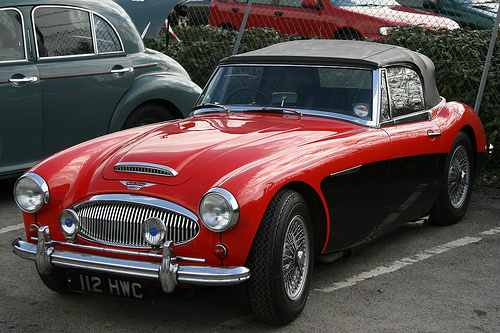 A 1961-63 Austin Healey 3000 BJ7 Mark 2 in good condition would fetch around £40,000/$60,000, whilst an example in showroom condition would command in the region of £80,000/$120,000.